The afternoon rumbling sent Tiona Page running to her apartment window in Miami. "It felt as if there was an earthquake," Page told ABC News today. "Me and my roommate jumped up and looked out." What Page saw from her 15th-floor window was a plume of rising dust. When it cleared, Page said, she saw the steel and concrete pedestrian bridge lying in pieces across busy Southwest Eighth Street at Florida International University. She could see slabs of concrete from the collapsed University City Bridge lying on top of smashed cars and then, Page said, she heard piercing screams coming from one car with its back end smashed under concrete. "The screams that were coming from the car were just terrifying," Page said. She said she immediately saw people who had been working on the bridge scrambling to get to people trapped in cars underneath the rubble. "I watched two people had to have CPR done on them," she said. 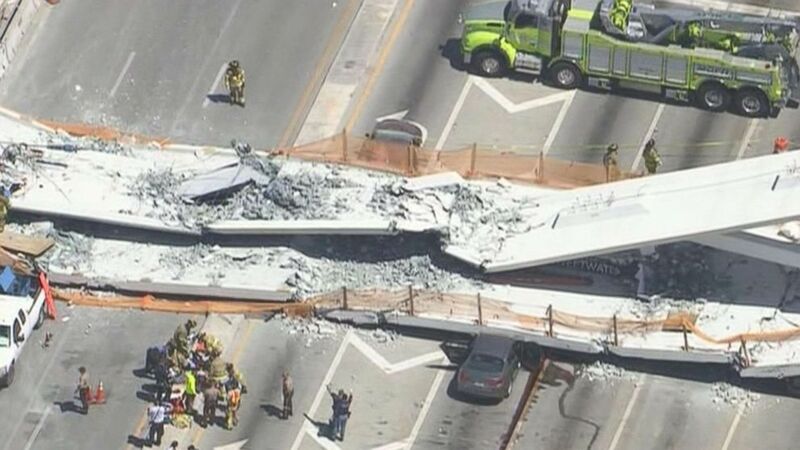 The bridge connecting Florida International University in Miami to the neighboring town of Sweetwater suddenly collapsed about 1:30 p.m.
Officials said there were multiple fatalities, and many others were injured. At least 10 people, ranging from age 20 to 50, were admitted to Kendall Regional Medical Center in Miami, including two men who were in critical condition, officials said. The 950-ton, 174-foot span was a prefabricated structure that was erected in a matter of just hours Saturday. The $14 million bridge wasn't expected to be open until December, officials said. Aleia Stillwell, 21, told ABC News she was driving home on Southwest Eighth Street and was stopped light with a line of vehicle in front of her lined up underneath the bridge waiting for the traffic light to change. "I was on the phone and I heard what sounded like thunder," said Stillwell, a student at Florida International University. "I looked around then I looked in front of me and I told my friend on the phone, 'I think the bridge just fell down.'" Stillwell said some cars in front of her began to turn around and she continued to move forward in disbelief of what she was seeing. She said it looked as if the bridge, which crossed eight lanes of Eighth Street, appeared to have collapsed in the middle of the span. She said she could see the rear of a Jeep, a Kia and a red Honda all lined up and crushed under the bridge rubble. "I saw what looked like a pickup truck to the far right hand side. The roof of the truck was completely smashed," Stillwell said. She said she then saw other panicked drivers in front of her get out of their cars and start running towards her. Stillwell said she takes Eighth Street home daily and is usually in a rush. "I'm glad I wasn't rushing today because that could have been me under there," Stillwell said. Paramedics and rescue workers were seen digging through the rubble, trying to reach a minivan and a large panel truck smashed under slabs of concrete. One woman was seen on a stretcher sitting up and talking to paramedics, while another man was lying on a stretcher in a neck brace. Stillwell said she saw another man on a stretcher who she initially thought was dead. "Then he kind of raised his arms," she said. Stillwell said the bridge was built after several FIU students were hit by cars crossing the busy thoroughfare. In August, a 18-year-old FIU student was hit by a car and killed crossing Eighth Street. "I think that we should just not build the bridge at all," Stillwell said. "We should boycott the bridge." Suzy Bermudez said she was also at sitting at the traffic light when the bridge collapsed in front of her. "I was the first car to go forward when the light changed. All of a sudden I saw it collapse from the left toward the middle, but it started on the left," Bermudez told ABC News. "I couldn't process it until I actually jumped out of my car ... and I ran toward the victims to see if I could help anybody. But the only thing you could see was the car lights in the front and the cars were totally smashed to the ground." She said she saw a woman who was still in her car and the rear end was smashed. "She was the only one in her car ... and we pulled her out," Bermudez said.